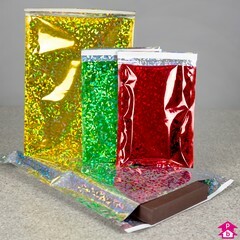 Decorative sparkling foil mailing bags with a holographic effect, with peel and seal adhesive strips for easy sealing. Simply wow your customers! See also our bubble-bag sparkling mailers for extra postal protection. 3 Products. 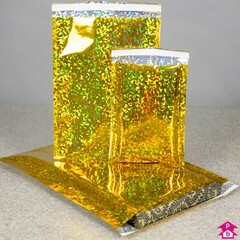 Golden sparkling foil mailing bags with a holographic effect and peel and seal adhesive strips for easy sealing. See also our bubble-bag sparkling mailers. 3 Products. 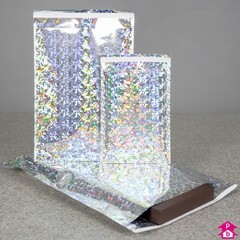 Silver sparkling foil mailing bags with a holographic effect and peel and seal adhesive strips for easy sealing. See also our bubble-bag sparkling mailers. 3 Products. 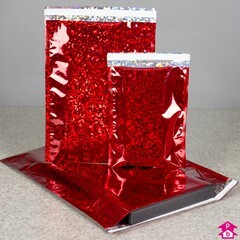 Red sparkling foil mailing bags with a holographic effect and peel and seal adhesive strips for easy sealing. See also our bubble-bag sparkling mailers. 3 Products. 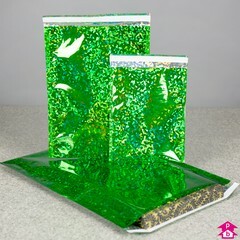 Green sparkling foil mailing bags with a holographic effect and peel and seal adhesive strips for easy sealing. See also our bubble-bag sparkling mailers.